This year’s National Public Lands Day (NPLD) marked a nationwide milestone for the 25th anniversary of an annual event that brings together public land managers, community partners and dedicated volunteers for a day of stewardship and celebration in public parks, forests and waterways. It’s a day to rally our efforts by working together to build momentum to keep these public lands accessible, safe, and beautiful for all. Our region is rapidly growing and with this increase in recreation demand comes a sense of urgency to celebrate what we already have, and directly benefit the future resilience of these public lands. Kicking off the NPLD celebration in the Middle Fork Valley was a special appearance and opening remarks by Congresswoman Suzan DelBene, a champion for public lands. 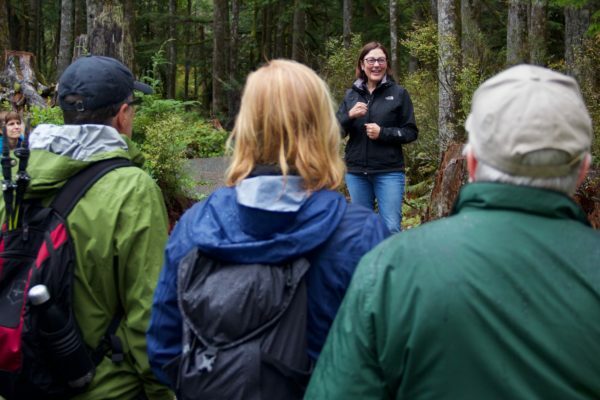 Joining the call for celebration, the Director of Environment at the Boeing Company, Steve Shestag, spoke to the importance of philanthropic investments to enable community-wide care of the Middle Fork’s well-loved trails. Among other speakers representing key supporters in this united effort, the Middle Fork had a moment to shine as the vital connection it serves to our public forests and mountains. 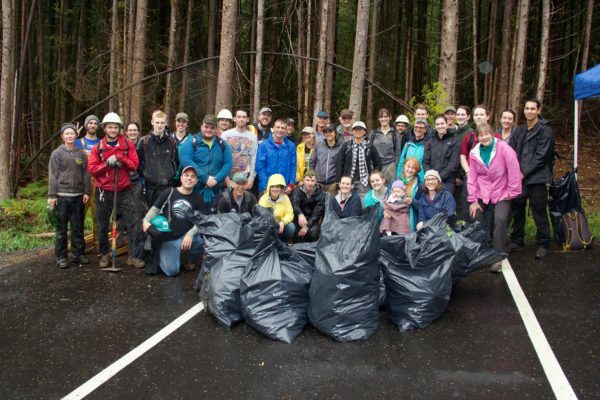 The Middle Fork Valley saw significant improvements on NPLD with 11 distinct volunteer stewardship events at six different sites. Working together with our agency and coalition partners, more than 150 volunteers participated in restoration work, trail maintenance, and special projects that maximized the more than 1,000 volunteer hours invested in the valley in this one day alone. Many thanks to partner organizations that helped lead these projects, including the U.S. Forest Service, Washington State Department of Natural Resources, King County Parks, Washington Trails Association, Backcountry Horsemen of Washington and the Pacific Crest Trail Association. Special thanks go out to our volunteer groups, including the Mountaineers, National Park Service, One Step at A Time, Microsoft, REI, 45+ Outdoor Singles, and the Boy Scouts of America (Troop 571). The support of our volunteers and partners is what turns a work-party into a rally and these volunteers went the extra mile, no matter how big or small the task. One of our signature projects of the summer was construction of the new Garfield Ledges Trail and its 40-car parking lot, in collaboration with the U.S. Forest Service. On NPLD, volunteers helped build and surfaced a 35-foot rock wall retention structure, installed 20 drains, and improved two switchbacks in addition to improvements to .5 miles of the unfinished trail, pushing it closer to completion. This new, one-mile trail will provide a short hike leading to a sweeping view back into the river valley. And through the passing rain, a group of fast working volunteers built and installed 14 picnic tables for the trailhead day-use area. In all, 16,000 square feet of the trailhead multi-use area was enhanced for a much-improved recreation experience. Nearby at the Middle Fork Natural Area and Granite Creek Trail work sites, volunteers removed and disposed of 5-10 cubic yards of invasive blackberry weeds. Lining up the bags brought a deep sense of satisfaction and many smiles to the faces of these weed warrior volunteers. Thanks to the King County Weed Watchers for helping to lead some of the weed survey and control work on the trail. The additional trail work and drainage maintenance on the Granite Creek Trail is an example of the proactive efforts needed to keep up with the resilience of these popular trails and natural areas in our public lands. After a productive day of work throughout the Middle Fork, it was time for everyone to come back together to recognize the shared effort and celebrate the day’s mighty progress. REI Co-Op hosted the Cheers for Volunteers event (a favorite volunteer perk) at the Middle Fork Campground, where volunteers gathered to enjoy a hearty meal, trade work-party stories, receive thanks and recognition, and feel like they were a part of something much larger in the Middle Fork and nationwide. At just the right time, the rain came pouring down, inviting the volunteers to re-group together under the campground shelter for words of appreciation by REI Co-Op and thanks from Jon Hoekstra, Executive Director of the Greenway Trust, followed by a lively round of pub trivia. And for the record, two teams tied for first-place, which led to a rock-paper-scissors showdown!